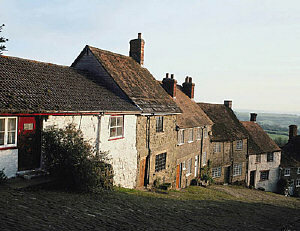 The town of Shaftesbury is set high on a the edge of the Mendips, providing spectacular views over the Blackmoor Vale. It is an ancient town lined with attractive whitewashed cottages and old stone buildings, especially around the High Street area, with its bowfronted shops and stone-built inns. Picturesque Gold Hill - star of the Hovis bread advert. This unspoiled and picturesque town retains a real flavour of old England and is often used as a setting for films and TV commercials. Its most photographed street 'Gold Hill' is a giddy steep slope of cobbles, with the the old abbey wall on one side and a row of stippy-stappy, tiled and thatched cottages on the other. Shaftesbury still looks much as it did several centuries ago, when the author Thomas Hardy made it the 'Shaston' of his Wessex. Originally a west Saxon town, its history began with the building of the abbey (circa 880) by King Alfred. However, most of the abbey buildings were demolished during the Dissolution and only the parish church of St Peter stands today. Excavated ruins of the old nunnery and abbey founded by King Alfred, which later became the burial place of Edward the Martyr. It was one of the wealthiest religious communities in the country up until the Dissolution when it was totally destoryed. The abbey ruins are set in peaceful walled gardens and a small but very informative museum tells the story of the Abbey and how the monks once lived. A charming local history museum housed in two historic cottages on Gold Hill and set in lovely cottage gardens with views over the vale. Exhibits cover a wealth of social history including books and manuscripts on local history, local archaeological finds and collections of tools, crafts and Victoriana. Dorset's once important button industry is also featured in one of the collections, and a fully restored 1744 manual fire engine is on display, complete with leather hose and buckets.